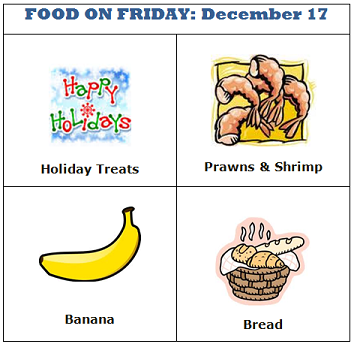 As you can see, there are 4 new themes – Holiday Treats, Prawns & Shrimp, Banana and Bread. While you can still link up at any time during the month, can I ask that you put one or two dishes for each category in right away. This should result in a good number of dishes for us all to explore. This worked well in November – thanks to all! Let's make the last Food on Friday of the year an even greater one! I seem to have lots of prawn & banana recipes ! This will be very handy for the holidays! Lots of new ideas. I brought you two banana recipes so far. Carole, my recipe could go under Holiday Treats as it is popular year-round, especially in cold weather, but a "must" at the holidays. Can be used as an appetizer or, as the French Canadians do, for breakfast. Hi Carole--just wanted to let everyone know that you can use any candy bars for this pie as Snickers may not be available outside of the US & Canada. Cheers! I'm sharing a few holiday treats. Don't have many banana recipes, but I do have a few shrimp ones. I'll share a couple of my favorites. Happy holidays to everyone! Cheers! I just linked up lots of bread! Excited to see what everyone brings for all these categories! Especially shrimp, I love shrimp but am not good at preparing it.